I came across an interesting ritual recently in a relatively unknown place which caught my attention. Let me tell you about the ritual first. This is famously known as the Yadnya Kasada Festival which takes place in the month of August. 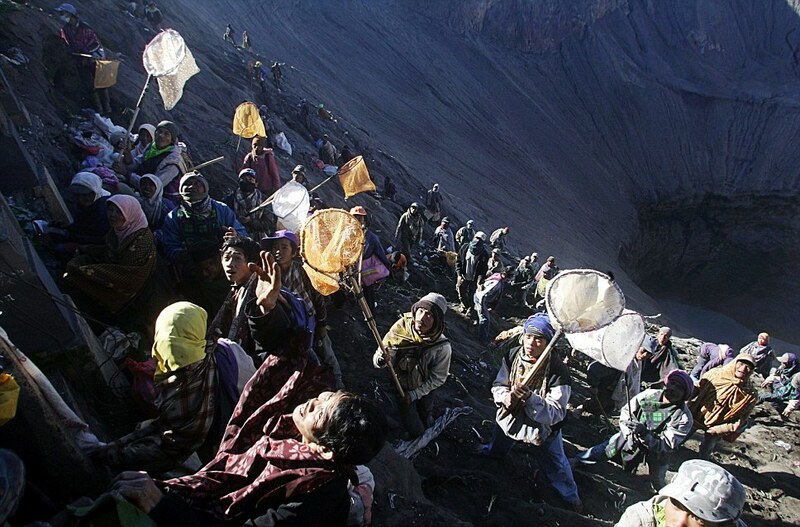 According to this festival, the Tenggerese people of a province in East Java travel up a mountain which is known as Mount Bromo and offer fruits, vegetables, rice and even livestock like chicken, etc. 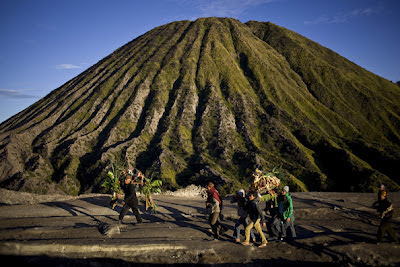 This is a practice that is followed since the fifteenth century and what is interesting is that Mount Bromo is an active volcano! 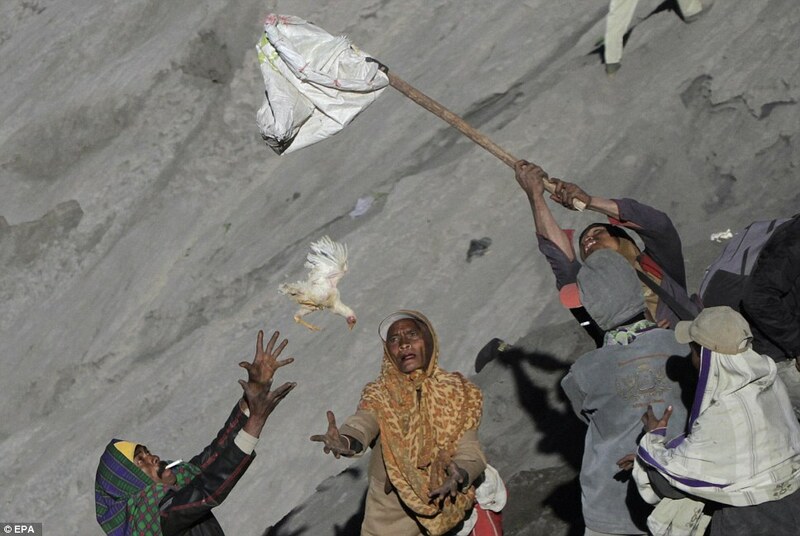 What is even more interesting is that before the people make their offerings, many of the poor locals climb inside the caldera waiting for the offerings with nets, to catch hold of the offerings for their consumption and also in a believe that the sacrificial offerings will bring them good luck. People who make the offerings are aware of it, but there is no objection to it. According to local mythology, Roro Anteng a local princess and her husband Joko Seger were childless for a long time. They appealed to the mountain gods to grant them children. The gods granted them a boon of 25 children, with a condition that their 25th child be named Kesuma and should be offered in sacrifice to the gods by throwing him in the volcano. When the child was born, he was sacrificed by throwing him in the volcano, though after an initial reluctance from the parents. The practice is still followed by the local Hindu population, however, in the form of non-human offerings now. Many say that the practice started as a ritual to appease the mountain god to remain calm and not send down streams of lava, since this is an active volcano. The aspect which caught my attention is that besides the fact that this is a Hindu practice, there isn’t anything to compare with such a practice (at least to my knowledge), in India. Except for the fact that it lends credence to the prevalence of human sacrifice in the days of yore, there isn’t any other parallel that I can draw. Another interesting aspect is that the mountain is named after Lord Brahma (Bromo is the Javanese pronunciation of Brahma, the Creator). To think that that there exists a volcano in the name of Brahma, in Java, when there hardly exists even a temple in India (except in Pushkar) is quite surprising in itself. Another aspect of this ritual is that before people proceed up to the volcano, a ceremony takes place in a temple called Pura Luhar Poten which is located at the base of the volcano, where the month long festival of Yadnya Kasada takes place. The uniqueness of the temple is that unlike all the Balinese temples, this one is not made up of red bricks and stones. The Pura Luhar Poten temple is made of black stones from the volcano nearby. Another significance of the festival is that it also marks the selection of a new spiritual leader who is appointed after an elaborate examination of his knowledge and faith. The Tenggerese are a minority tribe in the majority Islamic Java who follow the teachings of the Mahayana sect of Buddhism. However, in due course of time they have added aspects of Hinduism and are sometimes also referred to as Hindus in a more inclusive way. In the Pura Luhar Poten, the tribesmen worship the Buddha along with the trinity – Brahma, Vishnu and Shiva. The place is a great tourist attraction during the month of Yadnya Kasada Festival, which has its roots in an ancient myth! Once again Julian Assange is in the news. Once again the subject of the perils of whistleblower is in the news. Is it a crime to blow the lid off truth? Is it a crime to let the world know some dirty secrets, even if they are of the State? Is punishment right for someone who is doing such a great favour to the world by letting us all know as to what happens in the higher echelons of the government? World over, whistleblowers have never had it easy, rather they have been treated with a lot of scorn and have been put through a lot of trouble like Julain Assange of Wikileaks. Some have even been murdered as we have seen in the case of Satyendra Dubey (Golden Quadrilateral Corridor Project) and S Manjunath (adulteration of petrol). Many would see this as a price for speaking the truth or for telling the world what they should know. But first things first, who exactly is a whistleblower? “….a person who tells the public or someone in authority about alleged dishonest or illegal activities occurring in a government department, a public/private organization, or a company. The alleged misconduct may be…..violation of a law, rule, regulation and/or ….. fraud, health/safety violations, and corruption.” The word originated from the whistle a referee blows to indicate illegal or foul play. The word was first used in the 70s to avoid the negative connotations that words like ‘informer’ had in those days. Is it a new phenomenon of putting the whistleblower thru such trouble? In this context, we haven’t really come a long way. In our mythology too, whistleblowers have never had it easy and Greek mythology replete with examples of what whistleblowers have had to go through. 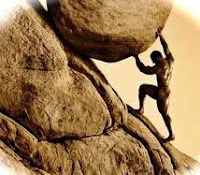 One of the most important examples is of Sisyphus, the King of Corinth, who had some heroic deeds to his credit, but was punished by the gods for the heroism. Sisyphus was witness to one of the escapades of Zeus, the King of gods. 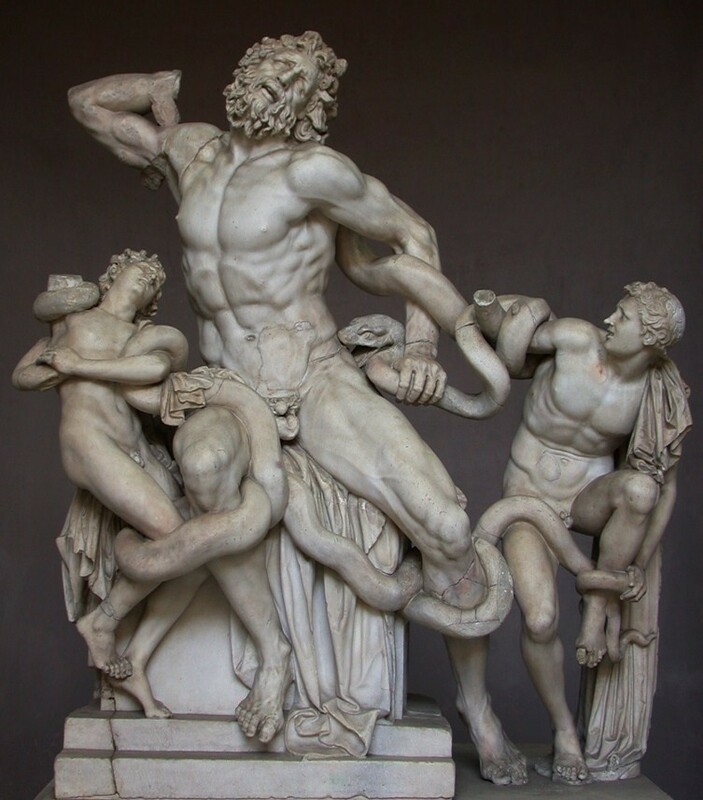 Once he saw Zeus kidnap one of the river nymphs and when the river god came looking for his daughter, Sisyphus revealed the location where Zeus had taken her. Zeus was outraged at this impudence, and as a punishment sent Thanatos, the god of death, to take Sisyphus’s life. But Sisyphus was too smart and decided to cheat the god of death, so that no mortal would ever have to encounter death! He managed to chain the god of death, till the gods came to know about it and sent another god to get the release of Thanatos. After some more events, all the gods were upset with Sisyphus, at his audacity. His crime – first, he revealed the secrets of the King of gods, Zeus, and second, he tried to keep death away from mortals. His punishment was that he would have to eternally push a big boulder up a cliff, till he managed to put it on top of the cliff. If he stopped, then the boulder would crush him, and if he reached the top, it would roll off on the other end, and he would have to start again this never-ending task. Here was Laocoon trying his best to warn the Trojans of a Greek conspiracy, and was punished and killed for his act, which ultimately led to the defeat of the Trojans. Many see this as a perfect example of what whistleblowers have to endure on their path to tell the world what they have unearthed. Finally, an example from the Vedic mythology, with not so serious ramifications though. According to this myth, a beautiful woman by the name of Puloma was betrothed to a demon. Once Rishi Bhrigu (one of the manas-putra of Lord Brahma) saw her and moved by her beauty, immediately married her and took her away with him. The demon discovered her, with the help of Agni and took her away with him. When Bhrigu came to know Agni’s involvement, he cursed Agni that from that day, he would consume everything offered to him. Agni protested that his actions were not wrong as he had only spoken the truth. He went on to say, that according to the laid rules, if one is asked a question and he speaks lies then his seven preceding and seven succeeding generations would be cast into hell. The same happens if one conceals the information, so by telling the demon the truth, he was simply doing his moral as well as religious duty. Subsequently, the curse was slightly ‘modified’, but that’s another aspect of the story. Can someone who goes against a nation (or against an establishment or a person) for what he thinks is mis-governance or a case of gross failure; be termed as a whistleblower, this time for the ‘other’ side? Let us take the case of Vibhishan from the epic Ramayana. He defected on Ram’s side and also gave in a lot of inputs to Ram, which enabled Ram to defeat Ravana after a prolonged battle. Vibhishan could be termed as a traitor from Ravana’s point of view, but a whistleblower from the perspective of someone who was trying to establish the rule of law and to rid Lanka from the clutches of an arrogant ruler who defied all norms of decency and kinship by kidnapping someone else’s wife and plunging the whole country in grave danger. Was this an act of a traitor or a whistleblower? Keeping aside the aspect of faith, this is a subject of debate, similar to dusk being the end of a day or beginning of a night. As we have seen, the concept of a whistleblower is not new. Nor is the witch-hunt that Mr. Assange is undergoing. What can make a difference is the mass awakening and awareness of such ills. We don’t have to take the dictates of a Zeus or a Bhrigu anymore and debates have to be allowed. If anybody has overstepped his brief then punishment is understandable, but stifling an individual’s right to expression, rather rightful expression, needs to be condemned, even if it is from the no-more-high-and-mighty Mr. US of A! Finally words of caution – whistleblowers, blow your whistle with caution; unfortunately the Big Brothers are still watching!! No, I am not referring to NASA’s robotic rover that landed on Mars recently. I am only referring to the emotion that every human being is born with. What is curiosity? Is it the same thing that makes parents proud when their child breaks open every electronic toy they bring for him, giving credit to the child’s curiosity and see it as signs of a budding engineer? (I can’t say much on this though, as my child did not break/tear a single toy – and I am glad she didn’t because child psychologists would come up with a very different conclusion if she tore apart a cute looking teddy-bear or broke a limb of her Barbie doll!). Many have opined that mythology is the result of man’s inherent curiosity to seek answers to various questions of life and nature. If it wasn’t for curiosity, then life would have no meaning and there would be nothing new to look forward to. Eve along with Adam was thrown out of the Garden of Eden by God when she gave in to the temptation of wanting to know the truths that were hidden from her. When Kunti in Mahabharata was granted a boon of begetting a child by just calling any god, she was curious enough to try it out. The result however was that she ended up with an unwanted baby and needless to say, that this single act of hers had huge ramifications in future. The Greek God, Zeus had given Pandora a box with an instruction that the box should not be opened. Curiosity got the better of her and she opened the box only to release all the ills in the world. In Mahabharata, on being invited to the Palace of Illusions by the Pandavas at Indraprastha for the coronation of Yudhishtira, Duryodhan could not contain his curiosity to see the whole palace without being guided by someone who knew the palace well. This curiosity landed him in a pool, evoking a strong reaction from Draupadi, and the rest as they say is history or should we say – epic? While taking up the assignment of making the idols of Lord Jagannath in Puri, Lord Vishwakarma had requested that nobody should see the idols before they were over. But the Queen could not contain her curiosity and opened the doors of the room where the idols were being made. It is due to her curiosity that the idols have till date remained unfinished! So is curiosity all that bad? Not necessarily. What is a man without a curious mind? How else would he ever want to know anything? If it wasn’t for curiosity, would you ever want to solve a puzzle? If it wasn’t for curiosity, would you ever read an adventurous or a suspense novel? If it wasn’t for curiosity, would you ever want to research a subject? If the bug of curiosity had not bitten many a scientist, would we have found answers to so many aspects of nature? A curious mind is what makes man climb the mountains and dive deep into the sea. 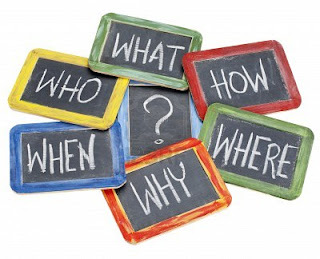 It is the same curious mind that is at work when a child keeps asking you all sorts of questions which start with a how, why, what or where. 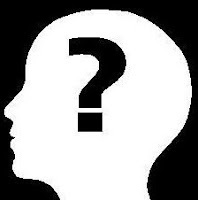 To conclude, curiosity is derived from a Latin word ‘curiosus’ meaning ‘careful’. Till curiosity is a quest, it is worth pursuing, but when it becomes careless and intrusive, it might lead one into trouble. When curiosity can become temptation, not many would understand, except Eve, I guess! So be careful and one doesn’t always have to learn the Kunti way! The holy month of Ramzan will soon come to an end followed by feasts and celebrations on Id. So what is it that makes this month so important for the Muslims? Ramzan (or Ramadan in Arabic), is the ninth month of the Islamic lunar calendar. Ramzan is considered to be a holy month for the Muslims and during this month, Muslims are supposed to observe fast during the daylight hours. Fast does not mean abstaining from food and drink only. A devout Muslim is supposed to abstain from all physical pleasures. Every part of the body has to restrain itself. The tongue should avoid talking ill and gossip. The eyes should avoid seeing unlawful things. The ears should refrain from listening to things which have obscene and vulgar content and even pleasurable content. The legs should avoid going to places of sin and vice, while the mind should refrain from unreligious thoughts. In short, during this time, the Muslims are called upon to re-evaluate their lives against the tenets of the Islamic way of life. 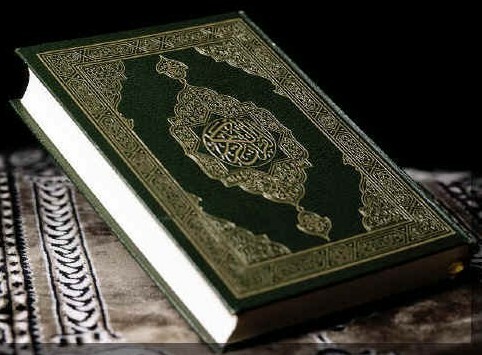 According to a legend, it was during the holy month of Ramzan that the Quran came into existence. It is said that angel Gabriel revealed the first verses to Prophet Mohammad, who though could not read or write, was chosen by Allah to be His messenger to the people. Allah’s words were communicated to Mohammad through Gabriel and it was these words which form the holy Quran. The first word of the first set of verses was “Read” and thus during the month of Ramzan reading the Quran is of utmost importance. The word Ramadan is derived from the Arabic word whose roots meant ‘parched thirst’ and ‘sun-baked ground’. This expresses the true spirit of fasting. Fasting in Ramzan has its own benefits. Such severe abstinence makes people realise what hunger and thirst means to people who are poor and cannot afford to eat. It makes one empathise with the poor and the needy. It also takes one closer to God and appreciate all that He has enabled for us. During this month, giving alms brings one closer to the community and develops a bond with people of one’s own community. On such days, breaking fast with the family and having meals together also generates a close bond within the family and community. The month of Ramzan is also a month where the devout give donations, knows as Zakat. According to Quran, one must donate 2.5% of one’s annual earnings as Zakat. As such one is supposed to donate all round the year, but donation during the month of Ramzan attains special significance as any good deed in this holy month earns huge blessings. Many have wondered why the fast is broken with the consumption of dates. Dates were found in abundance in the deserts and it is said that the Prophet Mohammad broke is fasts with dates. However, there seems to be a scientific reason to this too. During the fasts many undergo mild problems like headaches, low blood-sugar, etc. Dates are supposed to be a rich source of fibre, sugar, potassium and carbohydrates, and all this helps in maintaining a good health especially for a starving body. The carbohydrates in dates also lead to slower digestion, which is better than many other foods which are easily digestible giving rise to hunger faster. There is one more interesting aspect of Ramzan, and that is the namaz, which is something that all devout Muslims offer five times a day. However, there is another kind of namaz, which has significance and that is the ‘Tahajjud’ namaz. Tahajjud namaz is offered post midnight, i.e. between the Isha (night) namaz and the Fajr (dawn) namaz. Though Tahajjud namaz is offered during other months too, but the devout would not miss it during this holy month. An important aspect of this namaz is that this is not offered as a congregation. Offered as an individual and in the quiet of the dead night, it enables the devout to establish a contact with the creator. It is said that the Prophet himself missed the Tahajjud namaz deliberately to convey that this was not mandatory, but many a devout ensure that at least during the month of Ramzan they offer their respects by offering the Tahajjud namaz. The month long fast is broken on Id-ul-fitr, as according to the Prophet, observing restrain for thirty days, called for celebration. Id which is celebrated on the last day is characterised by a daylong celebration with sumptuous meals, but only after performing special prayers at the mosque in the morning and wishing one and all, by embracing them three times as laid down in the Quran. Here’s wishing all my Muslim friends Id Mubarak!! I want to remind one and all, that it is not for such times that people laid down their lives, for the present crop of leadership are not all that honourable. My countrymen, its for you and me to ensure change, it won't happen by itself. For now, let us see, hear and feel, let us keep a track of it all. Come elections, exercise your right and be responsible. Be the change, that we want, and change there will be! I am wishing all, a very Happy Independence Day, this is to ensure that the next ones are truly HAPPY, not just an adjective to the phrase Independence Day! In an earlier article, I had mentioned how Hindu mythology has played a very significant role in the Indian Independence movement (dated Aug 14, 2010). The then freedom fighters had made a very creative usage of themes from mythology to express to their fellow-Indians the plight of the country. The depiction of Bharat Mata, a personification of Mother Goddess, in chains has been a recurring theme in many a poster or old movies. With a budding printing industry, owned by the Indians, patriotic themes were transformed into images which were more evocative, expressive and communicative. I would like to take one such instance which is supposed to have had a huge impact on people in those days, and that is the myth of Markandeya. According to this myth, Rishi Mrikandu and his wife Marudmati were devotees of Lord Shiva but didn’t have any children. They worshipped Lord Shiva and sought the boon of a son. Shiva gave them a choice of an intelligent son with a short span of life or a not-so-intelligent son with a long life. The Rishi opted for the first option and soon they were blessed with a son, who was named Markandeya, who was destined to die on his sixteenth birthday. When Markandeya learnt about his impending death, he created a powerful mantra which is known as the Maha Mrityunjaya Mantra, an incantation which could win over death. On his sixteenth year, Markandeya embraced the shiva-linga and uttered the Maha Mrityunjaya Mantra non-stop. When the messengers of Yama, the god of death, came to take him they were unable to take him due to the power of the Mantra. This made Yama himself come to take Markandeya’s life. In his anger he threw the death-noose at Markandeya, which unfortunately fell on the shiva-linga. This angered Lord Shiva to no end and he rose from the linga to rebuke Yama. After a battle between Shiva and Yama, in which Yama lost, Markandeya was made immortal. Shiva is thus also known as Kalantaka or one who ends death. Since then it is also said that the continuous utterance of the Maha Mrityunjaya Mantra, keeps death away. In the adjoining picture, we can see the same myth being used for a different purpose. 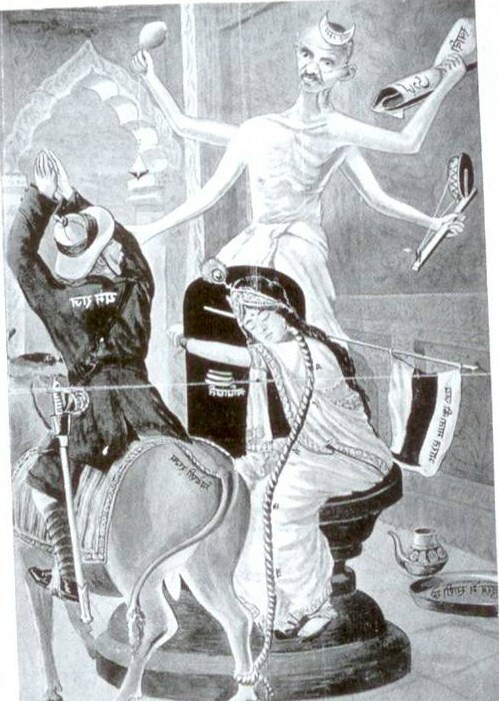 A close scrutiny of the picture shows Bharat Mata in place of Markandeya who is seeking divine intervention from the evils unleashed by the British (who replace Yama here and are thus compared with death). From the shiva-linga emerges Gandhiji who was seen as a saviour in those days. Gandhiji is shown with four hands, and each hand has aspects associated with him, his charkha, the spindle and his most important weapon, his writings, which are shown in the form of a newspaper. The four hands and the crescent moon on his forehead lend him a divinity due to the enormous task he had undertaken, that of eliminating the British from India. Another significant change is that Yama’s bull gives way to a cow in the second picture, which is again a sacred animal for the Hindus and a British sitting on it would have raised the passions of an ordinary Indian adequately. Such imagery was perceived as a necessity in the pre-Independence days, as many were not educated enough to read the articles written by the stalwarts of the Freedom movement. Also, many of the writings were either not printed and if printed, were soon banned. Further, in India everybody is well aware of their myths and any association with such myths always has an easy recall and an immediate understanding. Such deification might not go down well in modern India, but way back then; such instances were not seen as an act of sycophancy, but sheer need to communicate with the masses which was largely illiterate. This is one of the best examples of how mythology served such an important function in our Independence movement, especially at the grass-root levels. 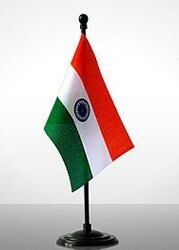 India was a land of many languages and writing and translating articles in many languages to all sets of people was a herculean task when information dissemination was not a simple activity as it is today. In such a scenario, a single picture could do what thousand words couldn’t. 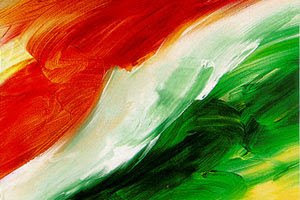 With this, here’s wishing all my readers a very happy Independence Day!! A fortnight back the world’s largest and by far the most extravagant sporting event started and tomorrow it comes to an end. During this last fortnight, the one single thing that was discussed the most were the medals that winners received, be it gold, silver or bronze. The larger the haul, the greater it is. 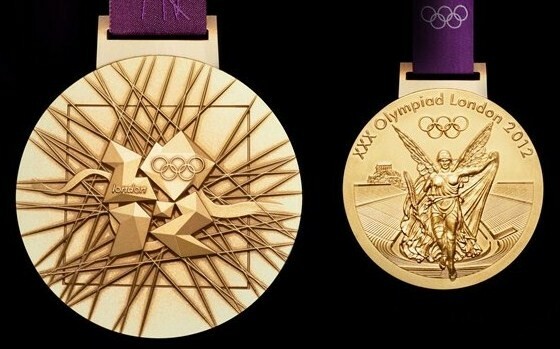 Let us take a closer look at the medal below is the two sides of a medal which has been handed over in the London Olympics 2012. On the right hand side is the depiction of a goddess. This is Nike. Since 1896, Nike has always been depicted on one side of the medals at the Olympics. Nike is the Greek goddess of victory. She was the daughter of the Titan Pallas and the river Styx. She is always depicted as a winged goddess who carries a palm branch, a wreath and the staff of Hermes. She is also sometimes shown hovering around victors in a competition. According to a legend, when Zeus was getting ready for a battle with the Titans, Styx brought her children to Zeus to side with the gods. Nike was appointed as his charioteer, and thus though she was the daughter of a Titan, she fought on behalf of Zeus in the war between the gods and the Titans. In classical Greek art, Nike is shown flying around battlefields rewarding the victors with glory and fame. According to another legend, the victory of the Battle of Marathon was to be communicated to the home city some 26 miles away from the battle-ground. The messenger was so exhausted that on reaching the destination, all he could say was “Nike”, implying victory, before he died out of exhaustion. Coincidentally, this is also the origin of the marathon as a long-distance race. Today Nike has been made famous by the well known shoe company which took the concept of victory and associated it with their goods! With this, its curtains down on London Olympics 2012 and so it is with my series on Olympics. 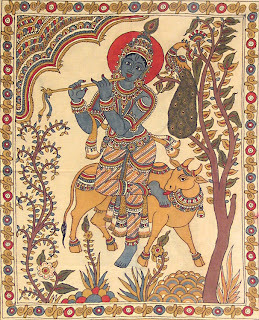 On the occasion of Janamashtami, the birthday of Lord Krishna, I would like to take up an aspect from the epic Mahabharata, for which he has been much maligned. This refers to the meeting between Lord Krishna and Karna prior to the war of Kurukshetra, where Lord Krishna reveals to Karna his parentage. Many have questioned the timing of this act, since it was just before the war and have accused him of trying to ‘buy’ the support of Karna. Was this not an emotional blackmail, which would have weakened him just when he needed to be strong? Was this not an act of extreme selfishness, especially when Karna was the greatest adversary of Krishna’s protégé, Arjun? Also, was it ethical to lure him with Kingship and all that was Pandavas to be his (surreptitiously speaking, Draupadi too)? To understand this act in perspective, it is important to understand the background. Lord Krishna was always against the war as he was well aware of the quantum of destruction of human lives. He had made all efforts to avoid a war, much to the disagreement of many who see him as a God. Right at the beginning, when the war was first proposed in the city of Virata, it was Krishna who had advised against it. When Arjuna came to seek his participation in the battle, he wowed not to take up arms in the battle and that he would not fight. But even that did not stop the war. All who have done justice to the epic would vouch for his earnest effort to stall the war. Seeing no alternative, he proceeded to Hastinapur hoping that he would be able to broker peace by meeting the seniors of the Kuru clan there. The meeting was not fruitful; rather it was quite acrimonious when Duryodhan ordered that the ‘cowherd’ be arrested. Thus this last effort too was wasted. Krishna never doubted the ability and the sincerity of Karna. One would also agree that Karna was a major strength of Duryodhana. If Karna’s assistance was not forthcoming, Duryodhana would never be so forceful for the war. If he felt that Karna was with his enemies, he could have refrained from the war and that was Krishna’s major objective of trying to stall the war. The offer to Karna to defect and all that was offered to him was not to ‘buy-him’ but to make the last–ditch effort to stop the massive destruction which only he could foresee. Needless to say, that this was in the interest of all. First, it was in the welfare of Karna, as he would become the King and would also be in the right company which he so deserved. Second, this would benefit Duryodhana too as in the event of a war; there was a distinct possibility that he would not only lose his kingdom, but his kith and kin too. Third it would also give Kunti a chance to accept Karna her first born and allow some legitimacy to the much-insulted Karna on his parentage. It was in the interest of the Pandava’s too as with the avoidance of war, the Pandava’s would be absolved of the barbarous war and slaughtering of their kin. This single act of revealing to Karna his identity was an act of supreme righteousness and goodness as the advice would save innumerable human lives. 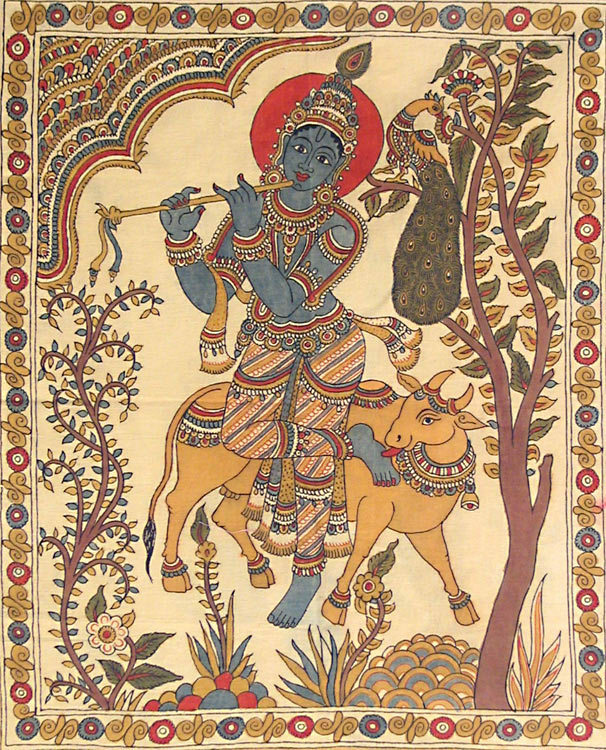 Was this a selfish act on the part of Krishna? It is pertinent to mention here that if Krishna’s intentions were malicious, then he could have revealed Karna’s parentage in public. If he didn’t achieve his prime objective of stopping the war, at least he would have had him broken in public. It could have created some rift between him and Duryodhana and Krishna would still have benefitted. But he did nothing of that sort. Krishna gave the brave his due and did not compromise with his sense of privacy right till the end of the epic. It is important to see certain things in the right perspective, though it is quite interesting to see things tangentially. Tangential vision creates for juicy controversy and gossip. But an educated and matured mind should see things in the right perspective, especially since we are talking of an important character in Mahabharata. Detractors and sceptics abound in this world and there are a many. But readers of this Blog are encouraged to see things the way they are and ought to be. Anybody disagreeing can write to me with their views, as debate is the foundation of a matured society, as against outright criticism. Happy Janamashtami to one and all, believers and non-believers!! It is tough and sad to accept that Team Anna has lost the battle against corruption and those who beget it, but it is extremely important for all to accept that they have lost. Introspection is always important after an event, more so if it is a failure. Please re-read all the above by replacing ‘They lost’ with ‘We lost’, because that’s what it is. Team Anna has not lost; it is we who have lost a great opportunity to do a world of good to ourselves. We lost our face in front of the next generation, who will ask us tomorrow as to what kind of irreparable India have we left for them? I can go on…..but then you too need to think, right?